He crossed the finish line -- arms coated in sweat, legs battered by fatigue -- and immediately went toward his father's wheelchair. Hell, where else would Chris Dessi even think of turning? It had taken him 5 hours and 26 minutes to run his own personal New York City Marathon on Sunday afternoon -- 5 hours and 26 minutes to think about the man who had taught him to drive a car and how to treat women with respect; how to study hard and how to follow passion and love over money. And now that it was, at long last, over, he wrapped his arms around his father Adrian Dessi, a 67-year-old ALS sufferer, and refused to let go. "I can't believe you did that for me," Adrian Dessi told his son. "I can't believe..."
"I know," Chris said, sobbing. "I know." In 37 years, Chris had seen his father cry but one time. "I was 8, and his good friend had passed," he says. But now, positioned alongside the track at Pleasantville High School in Westchester County, N.Y., Chris could hear the emotion in his dad's voice, coming from behind the breathing apparatus affixed beneath his nose. It has been a hellish 2 ½ years for the family, ever since Adrian, a retired data base manager, had been diagnosed with ALS, a disease of the nerve cells in the brain and spinal cord that control voluntary muscle movement and is, tragically, un-curable. In the course of those 30 months, Chris has watched as his father has stopped walking and breathing on his own, as his fingers have curled up and his arms turned into 400-pound dumbbells. "He's expeditiously losing muscle mass and the capacity to care for himself," Chris says. "I can't overstate how awful a disease ALS is. I can't overstate..."
Chris Dessi is not a runner. He never was a runner, still doesn't think of himself as a runner. Once, in the early 1980s, he completed a 10K race in his hometown of Mahopac, N.Y. "That was it for me," he says. "It's not a sport that has ever interested me." But then, somewhere between the innocence of boyhood and the nightmare of watching your hero waste away, he decided he could honor his father by raising money for the ALS Association, and the best way to do that would be through running in the New York City Marathon. Hence, over the past five months Dessi, the CEO of Silverback Social, a social media marketing firm, devoted much of his time to jogging the 2 ½ miles from his home in Chappaqua to the Pleasantville High track, where he would run round and round and round, his thoughts drifting to childhood baseball games and social media strategies and Derek Jeter's ankle and, mostly, his father. Cliché be damned, the slow, methodical jogs became Chris Dessi's therapy sessions -- "the energy that I wanted to put into a glass of scotch and a good cry, I turned to running," he says. He would simultaneously use Facebook, Twitter and his website to update friends and family members, while raising more than $3,000 in the fight against ALS. "It was hard, because, really, this isn't my sport," he says. "I had some great months, some awful months. I lost weight, fought shin splints, different injuries ... it wasn't easy, but it was very rewarding." Then, last Friday he received a text that the marathon had been postponed. Moments later his brother, Mark, sent a follow-up -- not postponed, cancelled. Chris' heart sank. And didn't sink. Like millions of others, he had lost power, and was actually staying with his parents, Adrian and Patricia, at their home in Carmel, N.Y. He was well aware of the devastation caused by Hurricane Sandy, and immediately felt the race had to be 1,435th on the priority list. "I had this vision -- a very real vision -- of the runners arriving for the start in Staten Island and people there showing up with clubs and beating us all up," he says. "And they would have been right to have done so. For us to run while all these people were struggling ... as people were dying ... it would have been awful." "I was taking a shower in my parents' house on Saturday morning," he says, "and the idea hit me." Chris Dessi would run for his father. Not in New York City, not in Philadelphia, not atop a New York Sports Club treadmill. No, he would run 26.2 miles on the place he knew best, on the place that had come to feel like a second home: The Pleasantville High track. He woke up Sunday morning and, at approximately 10 am, began the long, painful, arduous trudge. In the name of sanity (a.k.a. geographic diversity), he ran the first 10 miles through the streets of Chappaqua and Pleasantville. Then, he arrived at the track. It was, initially, like any other day. Four or five fellow plodders quietly circled around as Chris, wearing black shorts and his red TEAM ALS shirt, put his head down and jogged. As he started the 17th mile, the cars pulled up. His wife Laura, and their two children, Talia and Olivia. His brother, his sister in law, his cousins, his mother. And, of course, Adrian Dessi -- his dad. The cheering began. People from nearby fields started to take notice. One person told two people, two people told 10 people. 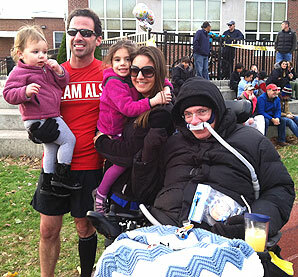 A fellow Pleasantville High track regular ran to nearby sporting events and raved about the man running to fight ALS. As the myriad soccer games ended, kids sprinted to the track to offer high fives and encouraging words. "Some kids started running with me, screaming, 'He's running for a cure!'" says Chris. "My brother said I was like Rocky, running through the streets of Philadelphia." Dirk Klingner, a former distance runner at Binghamton University, saddled up alongside Chris at mile 20. "You need some company?" he said. "You mind if I run along with you?" The two had never met. They stayed together for five miles. "Just the kindness of strangers," Chris says, "blew me away." As the 26th mile approached, a referee from a nearby soccer game blew his whistle -- mid-action -- and demanded the game come to a temporary halt. "Do you realize what's happening over there?" he said to parents and players. "We all need to see this." When he finally completed the last lap, when his New York Marathon was officially over, Chris Dessi was overwhelmed by the loud cheers that filled his ears. "I don't know -- maybe there were 25 parents in the stands," he says. "But to me, it sounded like the roar of 50,000."